Some years it still seems there is snow on the ground late in May. Some years there are late winter and spring storms. And some years everything is so perfect all are wondering why there is no run scheduled the week before Memorial day, instead of waiting for June. 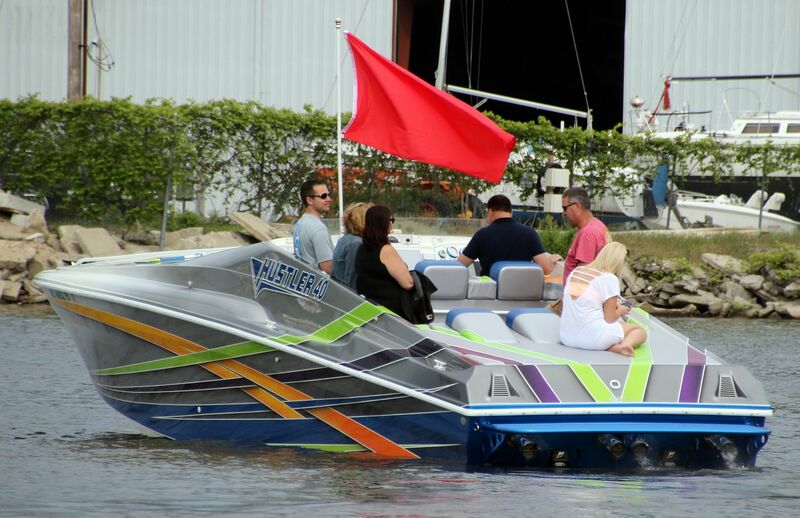 What is a Michigan Performance Boating Club to do? Best guesses are made, everyone commits to having their boats done and performing well by Memorial Day, and an early June run is usually considered with all fingers crossed. 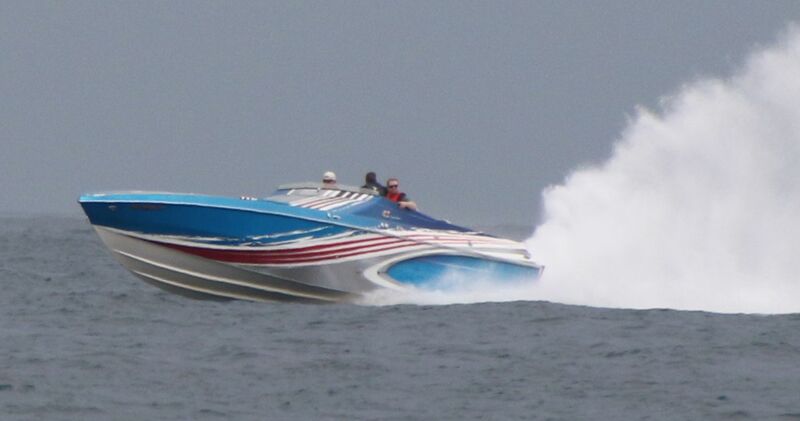 This year's first run for the West Michigan Offshore club was scheduled for June 3rd, the very first Saturday in June and immediately following the long Memorial Day weekend. The run was laid out to go from Grand Haven to Saugatuck, leaving at 10:00 in the morning. With memorial Day being the official/unofficial beginning of the northern boating season, what could possibly go wrong? Mill Time in Grand Haven. Weather issues?????? So, 60 boats signed up to make the run early in the year. As of a couple days before the run, there were still 40 boats committed. But then the weather forecast took a turn for the worse. By 10:15, when the first group was supposed to leave and head south, there was an entire green, red and yellow blob covering the northern half of Lake Michigan and heading directly southeast at Grand Haven. Now what?????? WMO directors monitoring the weather and trying to make a decision of whether to go or not? So with some deciding not to go, but most waiting for a decision, it was radar versus forecast versus West Michigan weather experience. The entire lake northeast of Grand Haven was green, yellow, and red on radar. It was moving southeast, directly towards Grand Haven. Wood TV was saying it would break up before it reached shore, but it was already on shore in Whitehall and raining in Muskegon. Since it was coming from the Northeast, and fronts from that direction break up over the cold water of Lake Michigan most of the time. And since the run was heading south for lunch, the decision was made to go. So almost 30 boats took off in three separate starts from Grand Haven and headed south for Saugatuck. Todd wishing for rougher water. All in all it was a really good day. There was barely any rain left when the front got to Saugatuck. The lake stayed plenty calm for the smaller boats to be able to make decent time on the water in both directions, (Boats ranging in size from 25 feet to 42 feet took part). There was a strong turnout of new members. And, even though Todd was strongly hoping for rougher water, he at least had a hose clamp fail so he didn't get completely bored. Thankfully, it ended up as a good day for performance boating and not just a day best for ducks!! what a great way to start a new season. straight bottom cig, full of fuel, 4 fat guys, no waves & rain coming in from the north west. lol. little claim for me but we made the best of it. big thanks to supersteve for all the time he spends maintaining the hot rod so we can do these club runs & chief performance / precision power offshore. we skipped the raft off & headed north. between port sheldon & rosy mound waves started coming up. 3' with maybe a few 4's by the time we got back to grand haven, so we spent about a 1/2 hour running from north shore to rosy mound bouncing around. 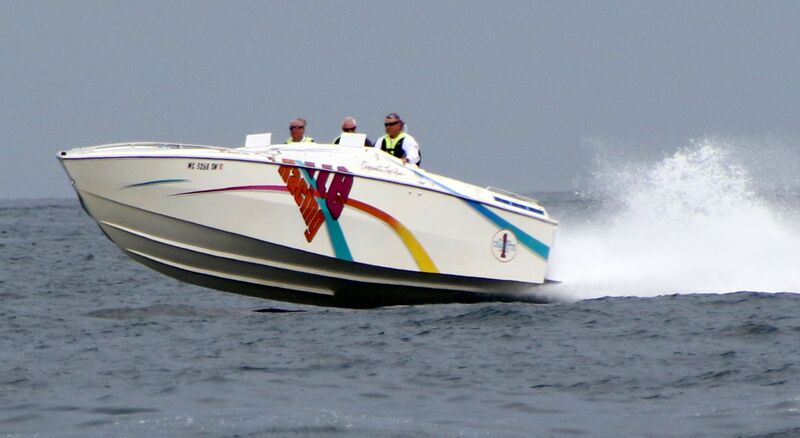 also a huge thanks to the west michigan offshore gang for all of there hard work putting these runs together. see yea in muskegon in 2 weeks. hoping for some water.